Students will review types of lines and shapes and identify lines and shapes by name. They will learn to look at an object in terms of lines and shapes in order to draw it-drawing observation skills. They will also learn about the artist Vincent Van Gogh & study his “sunflower” painting. 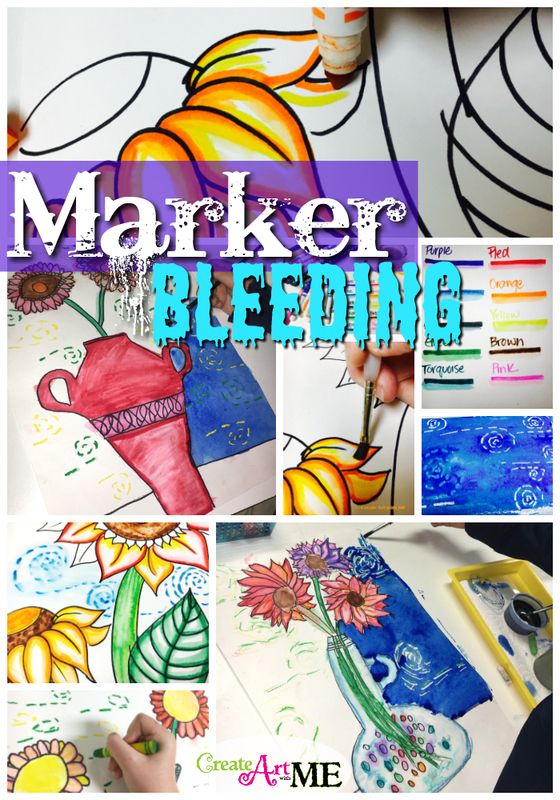 Students will learn the technique of marker bleeding to “paint” their artwork. Van Gogh was a Dutch post-impressionist painter in the mid to late 1800’s France. Vincent Van Gogh was born on March 30, 1853, in Groot-Zundert, Netherlands. Van Gogh died in France on July 29, 1890, at age 37, from a self-inflicted gunshot wound. He mentally “lost it”, cutting off his own earlobe, dying in 1890, two days after shooting himself in the chest with a pistol. Van Gogh did not begin painting until he was 27 years old. He had tried several careers like being a minister, teacher and art dealer, but he did not find success in these careers. He was only a painter for 10 years before he died. Van Gogh’s art helped him stay emotionally balanced. In Paris, van Gogh first saw impressionist art, and he was inspired by the color and light. Although he painted 870 paintings and drew 1050 drawings, Van Gogh only succeeded in selling one painting in his lifetime “The Red Vineyard”. Since his death, his paintings have been sold for many millions of dollars, including Portrait of Dr. Gachet, which went for $82.5m. in 1990. Van Gogh used thick brush strokes called impasto in which each brush stroke remained raised because of the thick application of paint. He created a signature style of art by using dots, dabs, and swirls to make the objects in the painting. Instead of smooth, blended applications of paint, Vincent used his brush to paint dots, dabs, and swirls creating a feeling of visual movement. 2. Still life is a picture of a collection of objects. Van Gogh’s “Sunflowers” is an example of a still life. a. Looking at objects purely as lines, shapes, and forms. Avoid naming parts of the object and instead think only as line and shape. 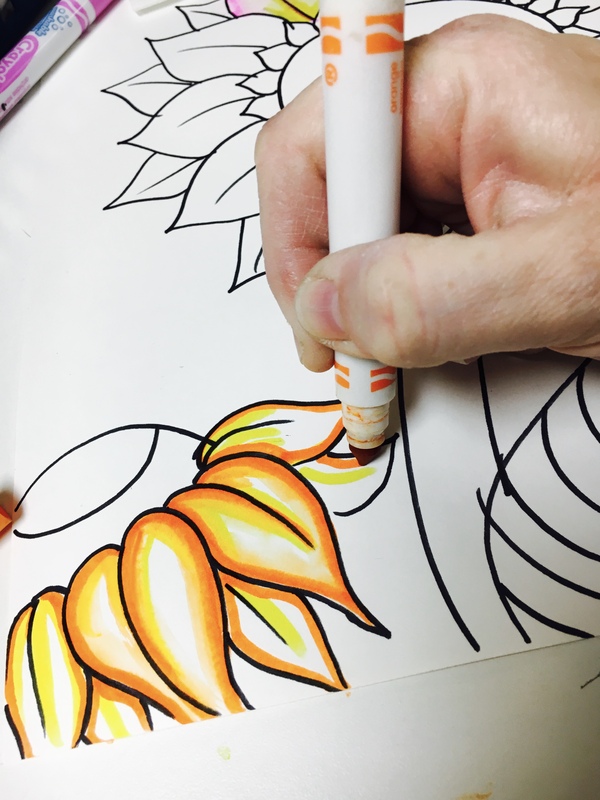 On 12×18″ white paper, in pencil draw the still life of sunflowers in a vase. Include a table line so it doesn’t look like the vase is floating in the air! Use observational drawing skills to accurately draw the still life onto the paper. Look a line angles and curvature. Look a shapes. 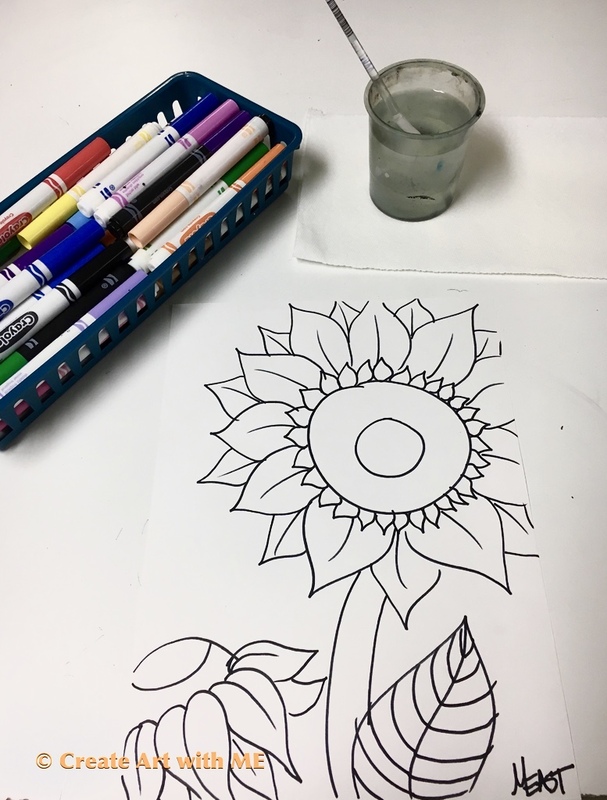 DRAW WHAT YOU SEE! Trace over all lines with thick permanent marker. Apply 1-2 lines of marker. I use REGULAR crayola markers ( NOT washable). We followed the outline of our design. 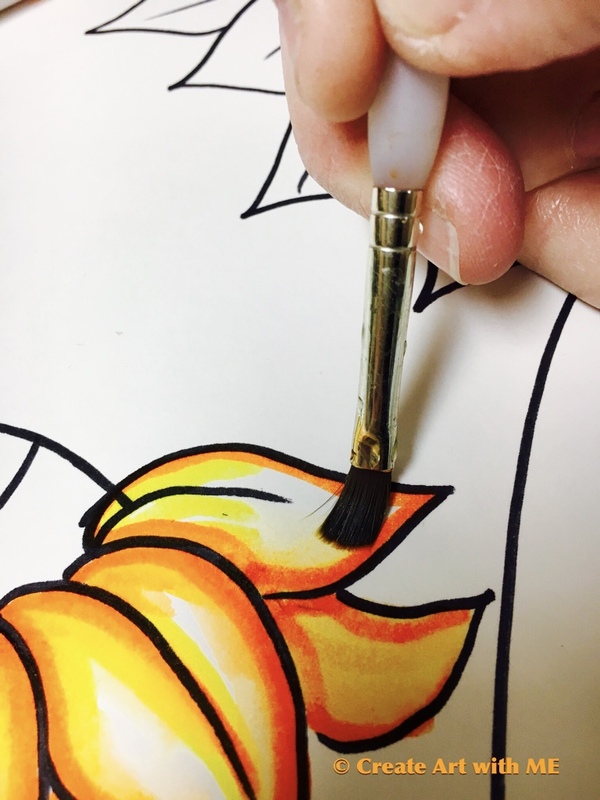 While the marker is still very damp use a paint brush with a small amount of water and GENTLY rub over the the marker pulling into white areas of the paper. *Be careful not to over rub the surface because it will rip especially if you are not using watercolor paper! By drawing swirls with oil pastels in blue, white and aqua then painting over with watercolors. This lesson was written by Michelle C. East 2017 © (All rights reserved). If you choose to use any of this lesson (written or photos), please link back to this blog Create Art with ME!